If you love to keep active, then there’s no doubt you own every piece of sports equipment there is, but all these activities come with a downfall – where on earth are you meant to store everything? From the outfits to the sports gear, storing this can be more tiring than a morning HIIT work out. We’ve come up with five handy organisation hacks for your sports gear to ensure you spend more time on the field and less time sorting your sports apparatus. Storing your sports clothes in their kit bags rather than in a drawer, you’ll seriously cut down your getting ready for the gym/training time. As soon as they’re washed and dried, put them back into the bag so you always know where they are and they’re ready to grab and go! Top tip: Keep your gym card, headphones and a refillable water bottle in your sports bag too so you never leave the house without the essentials. If you play multiple sports, it’s a good idea to have a gym bag for each activity for easy organisation. Then when it’s time for training, just grab your bag and go. Top tip: Make your own gym bag labels using a square piece of fabric and fabric pens. Then you can easily fix your tag directly to the bag using VELCRO® Brand Stick On For Fabrics. Peel and stick one strip to your label and one to the bag. Then you can change your bag labels easily in the future by just creating a new tag. Since sports shoes have a tendency to get muddy or smelly, it’s a good idea to create a dedicated storage space for them away from your other shoes (not to mention, they’ll probably need to be aired out each time you use them). Top tip: Put your shoes in large sealable plastic bags and leave them in the freezer overnight to kill any bacteria causing the odour. Bulky sports gear (such as golf clubs) can be hard to store, especially if you’re low on space. One of our top organisation hacks is to use these VELCRO® Brand Easy Hang Straps to store large and heavy items. 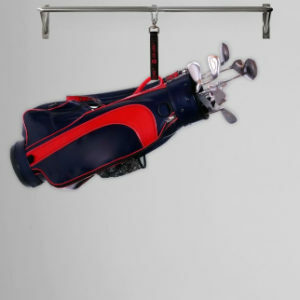 They’re strong enough to hold up heavy bikes and golf clubs and can be easily hung from hooks in your garage or hallway! For smaller items like bats and balls, store them in a netted bag that you can easily hang up with a VELCRO® Brand Easy Hang Strap as well. The netting will allow you to see everything inside, so that finding what you need is quick and easy. Top tip: Keep related items together to prevent losing track of them. For example, roll up your swimming cap and attach it to your goggles strap using a VELCRO® Brand ONE-WRAP® Tie. 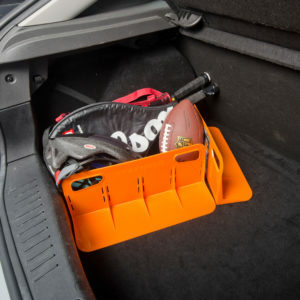 Last but not least, if you’re carting sports equipment round with you in the car but don’t want it to take over the whole car boot (or roll around), use a STAYHOLD™ Cargo Organiser to create a compartment in your boot. It’ll stick to the carpet in your boot to secure your sports gear and prevent it from rolling around. Top tip: Use a single STAYHOLD™ Cargo Organiser to keep your items firmly in place or a combination to create adjustable storage spaces that suit your needs. Now all your equipment is organised, you’re ready to go! And if you’d like more organisation tips, stay on our blog!